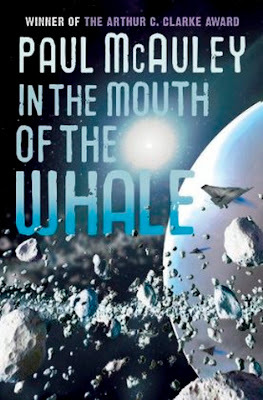 Paul McAuley's next book, In the Mouth of the Whale, was announced awhile back, but more info is starting to appear. Firstly, the UK cover has been released, which follows the style of his recent releases from Gollancz. It certainly works well enough for the Space Opera crowd, although I prefer Pyr's arts for his books in general. It’s a stand-alone novel that’s set 1500 years after The Quiet War and Gardens of the Sun and picks up the story of one of the players in the old drama: Sri Hong-Owen, a gene wizard who is her own greatest experimental subject. Sri wants to live forever. After a treatment that went badly wrong left her confined to a vat, she created a strange family from her own flesh and set off for the star Fomalhaut, to found her own empire in its great planetary ring. But history has overtaken her, as history always overtakes people who live too long. Her starship was damaged; she died; those of her children who survived have rebooted her by recreating her childhood. Meanwhile, a posthuman group, the Quick, has reached Fomalhaut ahead of Sri and founded a new civilisation which fell to another group, the fierce and largely unmodified True, who enslaved the Quick and set up their own empire. And now, as Sri’s starship approaches Fomalhaut, the True are fighting interlopers from another interstellar colony for control of the gas giant Cthuga, whose core may be the home of a vast strange intellect. What else? There’s an outcast librarian who, with the help of his Quick servant, fights demons in fragments of a vast data base. The disappearance of one of the scions of a powerful family. Thistledown cities and an archipelago of engineered worldlets. A big dumb object floating in atmosphere of a gas giant planet, probing for signs of life. War in the air. A vivid dream of childhood that begins to unravel. A secret hidden in the cityscapes of a virtual library. The termitarial mindset of a cult that’s lasted 1500 years. Visions of cul-de-sacs in human evolution. The utility of intelligence. The cost of longevity, and that perennial problem of what to do for the rest of your life after you die . . .
Fomalhaut was first colonised by the posthuman Quick, who established an archipelago of thistledown cities and edenic worldlets within the star's vast dust belt. Their peaceful, decadent civilisation was swiftly conquered by a band of ruthless, aggressive, unreconstructed humans who call themselves the True, then, a century before, the True beat back an advance party of Ghosts, a posthuman cult which colonised the nearby system of Beta Hydri after being driven from the Solar System a thousand years ago. Now the Ghosts have returned to Fomalhaut, to begin their end game: the conquest of its single gas giant planet, a captured interstellar wanderer far older than the rest of Fomalhaut's system. At its core is a sphere of hot metallic hydrogen with strange and powerful properties based on exotic quantum physics. The Quick believe it is inhabited by an ancient alien Mind; the True believe it can be developed into a weapon, and the Ghosts believe it can be transformed into a computational system so powerful it can reach into their past, collapse timelines, and fulfil the ancient prophecies of their founder. In the Mouth of the Whale is scheduled for a January release in the UK from Gollancz. No US date has been announced, but hopefully Pyr will continue their relationship with McAuley and release it sometime in 2012. This would be so much cooler if it was actually a picture of the mouth of a whale.